Candles are romantic and soothing. Whether you light them up for dinner, or to enhance the scent in your room, candles can be very soul-pacifying. We often relate candles and warmth to winter. But, with the right colours and scents, candles can be very spring-welcoming. Rather than going to the store and buying some candles, you can make your own. Why make candles when you can buy them? Well, for starters, you can actually get more use out of them and they can be more economical in the long run. Also, you get to mix and match any colour and scent you please; you can customize them with words; and you can make a one-of-a-kind candle. And most importantly, it’s fun! You can do it in your spare time, with some friends (have a candle-making party — why not?) or with your family members. Before melting the wax and having fun with the colouring and scents, you need to pick the containers for your candles, as the wax will have to be poured as soon as it heats up. Clear drinking glasses will work; you can also pick up square tealight holders from any dollar or crafts store. You can even use empty jars. Just be sure to use a glass container so it doesn’t melt! Glue your wick to the bottom of the container and cut it to the desired height. Having prepared your containers, you are now ready for the actual candle-making. You can use solid wax, but it melts at a higher temperature and it has a shorter burn time than soy wax. Heat up the appropriate amount of soy wax in a melting pot. Make sure to look out for its specific melting temperature, using a thermometer to guide you. Add the dye and the scent and keep stirring till the melting point is reached. (You can choose not to colour it and can use vanilla extract if you don’t want to buy different scents.) Pour the liquid wax into the container of choice and give it 45 minutes or so to solidify. 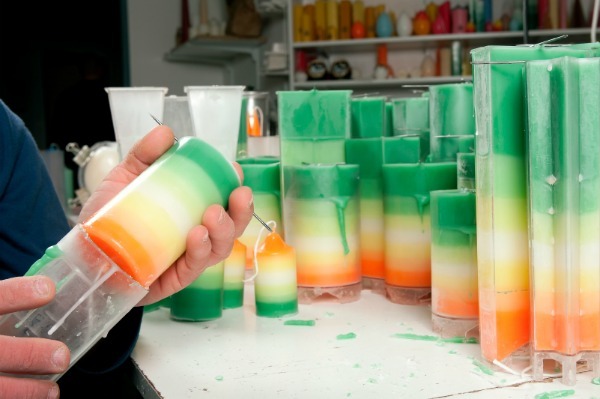 Now that you know how to make candles, it’s time for some ideas for making them more spring related. Pick out light and colourful colors! Spring is when the flowers start to bloom again, so you can make lavender, pink, yellow and orange candles. Rather than using chocolate, cranberry or mint scents, use something a bit more fresh. Fruit- and flower-scented candles will make your home smell like a fresh garden once they are lit. And finally, decorate your candles like it’s spring! You can name your candles after flowers or use 3D flower stickers to cover your glass/jar.